There are so many wonderful travel accessories these days, it's hard to keep track of what to purchase your intrepid travel junkie. But this item is well nigh perfect: it's elegant, small, and let's the traveler take their essence on the road. 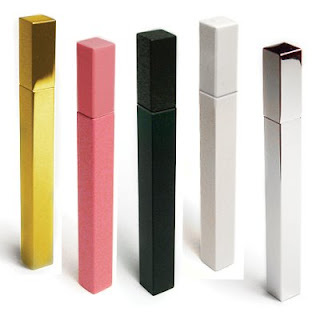 This tiny perfume atomizer can fit literally anywhere. It can hold any scent, from classic Chanel No. 5 to hippy patchouli oil. And, best of all, it doesn't spray. This little roll on keeps the traveler's scent intact and on their body, not liberally blasted throughout a room (considered enormously bad travel etiquette, by the way). This company also makes a lighter with precisely the same footprint, perfectly designed for travel. Buy them as a set and let the wandering begin. Find it all at www.mollaspace.com. Yes, they certainly do. But don't try it or you'll get a mouth full of wax. Obviously I have sweets on the brain this week, but these candles look so yummy, and are perfect as decoration at a child's elegant birthday party (meaning under the age of two, while the kid still has no idea what's going on and the party's really for the adults). 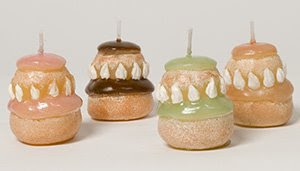 These candles are flaming representations of a little-known French confection called a Point a la Ligne Religieuse. Basically, it's just a fancy name for a stacked cream puff. But, since shipping a cream puff from the EU isn't a possibility (just ponder the food poisoning possibilities), this is as close as anyone in the US is going to get. At just 4 bucks a pop, they'll definitely add some sweet and affordable atmosphere to a party table. Order them at www.roseandradish.com. But whatever happens, don't let the kids take a nibble. There's nothing more frustrating than a wanna-be collector. Collecting art takes time, taste, and funds, and at least two of those things are usually in short supply. Occasionally, though, art is affordable. Take these limited edition beach towels by famous artists, for instance. 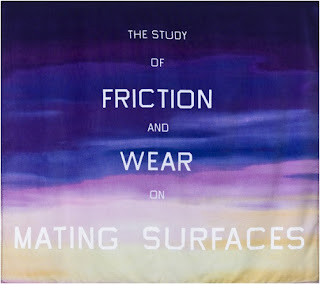 Each hefty toweling is a true example of each artist's inimitable style, from L.A. fave Ed Ruscha (pictured) to New York legend Julian Schnabel. And you don't have to limit this art to the beach. Just stretch it on a frame, hang it on a big wall, and viola! Suddenly, your collector has some serious artwork for an unserious price. These towels, as far as I know, are only available at www.artwareeditions.com. And while you're there, check out all the other limited edition pieces available; it's quite the fine art find. Warning: these cookies won't be everyone's cup of tea (although they'd go quite nicely with a cup of tea, really). But for those who crave sweet, delicate, and satisfying sugar rush, they'll fit the bill perfectly. French macarons are, in my humble opinion, the most exalted cookie on the planet. Consisting of two light yet chewy meringue domes encasing creamy ganache filling, they are the queen of sandwich cookies (eat your heart out, Oreos). And Paulette Macorons make some dandy ones, in flavors like salted caramel, green tea, sweet wedding almond and so much more. So yummy. So perfect for your favorite sugarhound or sweetheart (and the pretty boxes are nice, too). 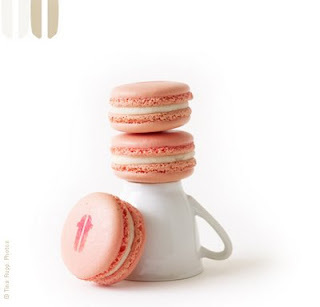 Order these Parisian perfections at www.paulettemacarons.com. You know it's true. They call themselves "birders." But, in reality, they're little more than avian-loving peeping toms. Here's a gift that makes spying on nature that much easier. 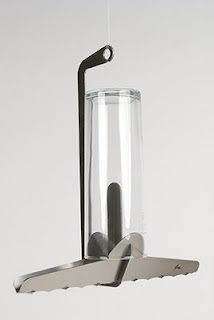 This super-modernist bird feeder is not only sleek and streamlined, it's also clear, for unparalleled bird feast visibility. And, during the food deprived winter, it provides the perfect opportunity for a free meal. Everybody wins! You might keep in mind that this gorgeous feeder will be significantly less aesthetically pleasing with bird poop all over it. But I guarantee you, your spying birding friends won't mind a bit. Capture a clear glance at www.roseandradish.com. In the world of hot beverage aficionados, there are neat sippers and sloppy sippers. It's likely that you know a few of both. Luckily, this item does double duty. 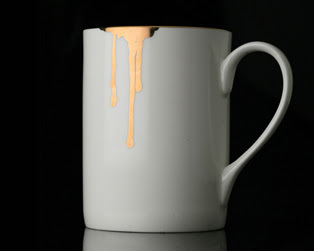 For the neat sipper, this already drippy mug is, at least, dripping lovely gold rather than murky brown down its side. For the sloppy sipper, the mug's aforementioned lovely gold makes the mess somehow more appealing, with a touch of class. And, if your giftee is just a drippy personality, then it's ideal, too. You'll find this cup overflowing at www.hiddenartshop.com. This isn't a problem in Los Angeles, but in other, colder parts of the nation, life stinks. I mean, think about it: a whole family, trapped inside all winter long with central heat blasting. That's going to produce a malodorous habitat for sure. Although you could send your friends imprisoned in the Bog of Stench a lovely candle, this is a much more stylish (and flexible) solution. This tiny house has room for just one temporary resident, a cone-shaped piece of incense. 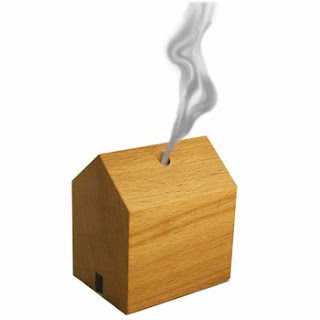 Light it and lovely smells flow through the home's chimney, banishing that stagnant winter air. Send a variety of scents and your housebound friend can pick their scents to enliven their senses. This reasonably priced piece of real estate can be purchased at www.aplusrstore.com. At around this time of year, once the holidays are over, the blahs set in. And unless you or your friends are the lucky few, you neither have the funds or vacation time required to take a trip, far far away. Enter the escape of a more literary sort. This big and beautiful book is brimming with gorgeous photographs, thoughtful writings and amusing sketches all about Africa. 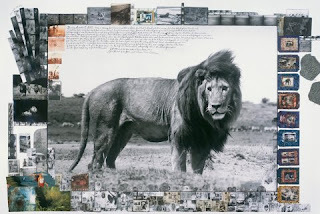 Written by photographer, adventurer and fabulous rake Peter Beard, the book is the closest thing you're going to get to going on safari, sans shelling out big bucks and getting painful injections in the heinie. So beat the wintertime blues! Buy this book, rent Out of Africa, and settle in for a weekend virtual vacation in Kenya and beyond. Find it at www.taschen.com. Looked at the newest jewelry trends? They're going big, bigger, biggest, with a sort of funky ethnic edge. And I know that you have at least one trendy friend who wants in on the action. Here's the answer, for far, far less than that plastic Marni breastplate your friend has been coveting. Jewelry maker Ronni Kappos designs lovely pieces (some delicate, some bold) made out of rare beads from the 1930s and '40s. 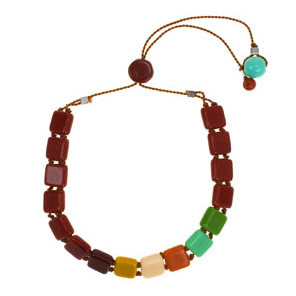 Although these beads are old, her pieces look decidedly cutting edge, with a bright modernist sensibility that works with conservative cardigans and slinky cocktail dresses alike. An added plus: this jewelry is fairly green, since it's made with used materials. Just another way to both embellish the body and feel virtuous at the same time. Take a look at Kappos' s lovely wares at www.beklina.com. We've all heard about the benefits of houseplants. They clean the air. They enliven our space. They subtly remind us that once, eons ago, we actually lived amongst them. But, we also all know someone who, well meaning though they might be, still manages to slaughter every green thing that enters their living space. Well, no more. 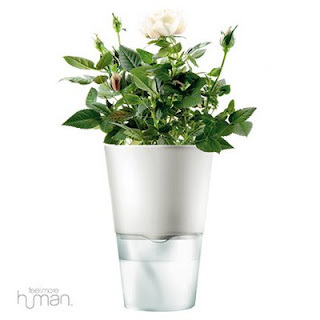 Meet the self-watering planter. This slightly modernist (but ultimately style flexible) planter protects tender green things from a grisly under or overwatering death. Just hand your black thumbed friend an already planted specimen in this planter (for god's sake, don't let them do the transplanting), follow the planter's clear instructions, and wait for it to bloom and grow. You can find these green saviors at www.feelmorehuman.com. It makes being green just a little easier for humans and plants alike. In this incredible modern age, all the desperate housewives (and househusbands) you know can just hop online for recipes when there's a dinner emergency. It may be convenient, but between typing, scrolling and printing, it feels more like office work. Give your reluctant cook a culinary blast from the past. 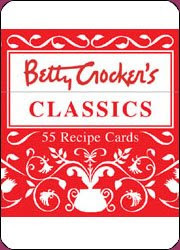 That old classic, The Betty Crocker Cookbook, is now available in card format. Resting in its neat retro box, these cards offer all the old classics, from mac n' cheese in myriad forms to the best cakes and cookies their grandma never made. It even gives tips for cocktail snacks (the Flaming Cabbage, complete with Vienna sausages for searing, is one of my personal favs). And it offers all the cholesterol of Paula Deen without the hyena laughter. Take that, Food Network. You can locate this miraculous recipe file at www.koodekir.com. And as a thank you, make them bake you a cake. It's that time of year. The gardener in your life is surveying the wreckage of their once verdant and lovely yard, wondering if it will ever be the same. Dead leaves, bare branches, brown lawns, all tempt the gardener toward gloomy horticultural philosophy. So help them clean it up! These very strange Gnome-Be-Gone garden sculptures can help carry out cheesy Garden Gnomes (or garish Pink Flamingoes) roaming their yard. Although I own a Garden Gnome myself, he stands sentry and carries a fish in a rather charming, surrealist fashion. These little metal chompers come complete with their own deceased Gnome or Flamingo, which must be either carried or pulled off the premises (and there's no funny fish involved). Order this handy clean-up crew through www.uncommongoods.com. Every kid goes through it. One night they're sleeping just fine in what amounts to a coal mine, the next night they're suddenly afraid of the dark. Obviously, a night light is in order. There's no shortage of night lights available. Most are ugly, incandescent things. But this one is different. These hangable LED lights are available in different animal shapes and sizes. They shine a comforting glow in various colors (essentially, mood lighting for the paranoid tot). And they actually add to the room's decor and theme (especially if the child is into animals. Or, as shown in the picture at right, if the kid's a republican). Elephants, fish, butterflies and horses all add up to not just a light source, but a nocturnal friend and dream guide. They'll keep those monsters at bay. Check them out in all their shining glory at www.objects-of-design.co.uk. Very grown up lemonade, that is. And I don't mean some silly Lemon Drop mixed with designer vodka, either. I'm talking about giving your favorite foodie personality a sunny treat (this will work particularly well if he/she lives in the frigid midwest and east coast). I'm talking about Meyer lemons. These sweet globs of citrus gold are almost impossible to find in markets, almost impossible to locate away from the west coast, and basically require your own backyard tree if you ever want a good ongoing supply. Luckily, the food company Earthy Delights now ships Meyers all over the country. Your snowed in friend can use the Meyers' luscious juice for salad dressings and baked goods, the fabulously delicate zest to flavor pasta, soups and stews. For maximum lemon leverage, they could even preserve the whole shebang, Moroccan style (consult Paula Wolfert for the method). And while you're at it, throw in some lemon-infused olive oil for good measure. Just a reminder that sunshine is around the corner (or already exists in California, if you really need to gloat). 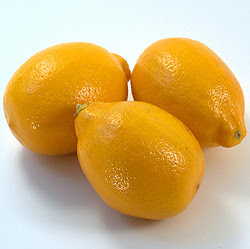 Go to www.earthydelights.com for Meyer lemons by the pound. Yes, you have a disgruntled friend who works in an office, lives day in and day out in a cube inside said office, and is on the verge of suicide now that the holidays are behind us (no office parties, no more time off, no more free booze). Help them save themselves! Distraction is key in repelling the office winter blues, and these little desk cubes might be the answer to what ails them. What are they? Not quite sure, although I'm sure your desperate friend could find dozens of uses for them, from using them as paperweights to building that stairway to Shangri-La. 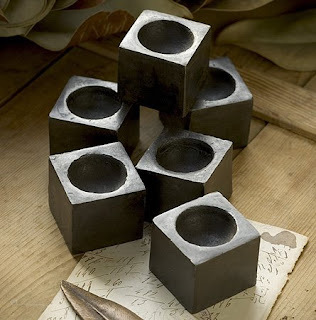 Whatever their use, these metal cubes look official enough for a professional setting, while supplying minutes to hours of soul healing cube construction time. Offer your friend relief at www.mothology.com. It'll stack their odds of surviving the winter season well in their favor. Actually, this child gift (that'll really charm the all-important adults) is way way cooler than any silver spoon. After all, how many kids have their very own genuine mid-century modern ceramic plate set? 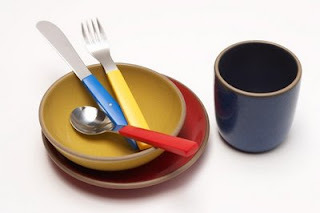 This colorful yet understated set is by the famed company, Heath Ceramics. Heath is one of the only original mid-century modern ceramics companies left. Started in 1948 in Sausalito, California, this company and its superior products have remained remarkably true to its original mission. These are beautiful plates and accessories, and now they've produced a kids' version of the grown-up tableware, just to get the fashionable tots hooked on the real McCoy early. One warning: these are not plates for kids who view their dinnerware as flying saucers. This is heavy duty stuff, meant to last a lifetime, and getting conked in the head with it might require a trip to the ER. All of Heath's products are available online at www.heathceramics.com. One thing that I've noticed over the years is that a woman will have a beautiful handbag, but her wallet is usually a disaster. Bulging to capacity with bills, cards, and old receipts, its lumpen shape circa 1996, that old wallet demands retirement, NOW. Here's the perfect wallet replacement. Commes de Garcons wallets come in a variety of shapes and sizes (prices, too; some may be a bit too dear and are best as a "joint" gift). The colors are rich and make it easy to locate even in the biggest fumbler of a bag. And they're simply well designed. No more overstuffing. This forces some major editing, culling the unnecessary cards and paper flotsam invasions. Excellent. So make them treat their funds with respect. 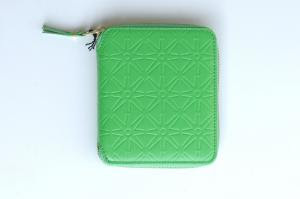 Commes de Garcons wallets are available in all their glorious permutations at www.okstore.la. Now what a great gift that would be! Alas, you cannot produce the actual formula for your depressive friends, but you can give them the symbol in silver to wear as an anti-gloom talisman. This lovely necklace looks just like an abstract modernist design. 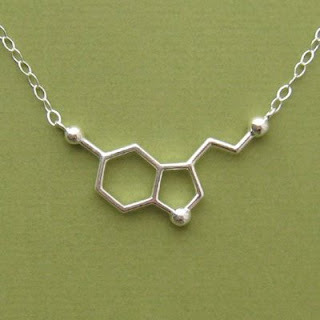 But only nature could've produced these shapes, as it's really the molecular structure for serotonin. You know what serotonin is: the body's equivalent of happy juice, swimming through the bloodstream like a sweet syrup of contentment. And trust me, your crabby friends know what serotonin is, too; mostly, they don't have enough of it. The necklace is made, fittingly enough, by a company called Made with Molecules. And you can find it at www.supermarkethq.com. It's a reminder that a good mood is just a few molecules away. If you're ever within shouting distance of a little girl, you already know that fairies are all the rage. Flower Fairies, Gnomes (ok, technically not a fairy, but still classified as a magical creature), and even that snot Tinkerbell all get top billing these days. And, as I was informed by a seven year old Fairy Authority, fairies love gardens and flock to them in vast numbers... but only if the proper Fairy Attractions are in place. So what are Fairy Attractions? Some are simple, like shiny rocks and crystals tucked in amongst your roses. But some are more complicated. 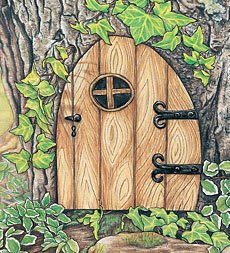 Take this lovely Elfin Door, for instance. Difficult to make, insanely easy to purchase, and it also comes in a Toadstool edition (I don't know, maybe to attract trolls or something). So give that little girl's garden a lily gilding and give her the proper Fairy Attractions. Visit www.magiccabin.com for Fairy Loot. It's great to give. It's great to receive. But it's sure a bummer to have to acknowledge. Such a bummer, in fact, that most of us fall short, meaning to write the blasted thank you note but never getting around to it. I'd like to say there's some service you could hire for your well-meaning but manners-negligent friends, but alas, I've yet to discover it. The best I can offer are notecards so evocative and insistent in their design, they literally compel thank you note composition. 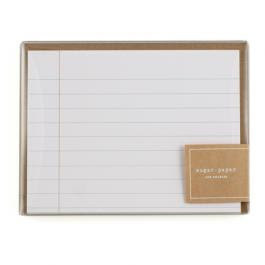 These cards look exactly like the notebook paper you used in school: no nonsense, orderly, and demanding that each line be filled (and filled neatly, mind you). It's like having some strict schoolteacher perched on the side of the desk, explaining the pitfalls of procrastination and poor manners. Locate these autocratic thank you notes at www.sugarpaper.com. They say nicotine is more addictive than heroin. It's probably true. Ever seen someone quit smoking? The spaced out reaction times, edginess, and full out rage has to be seen to be believed. A nasty business. This could be the quitter's alternative. 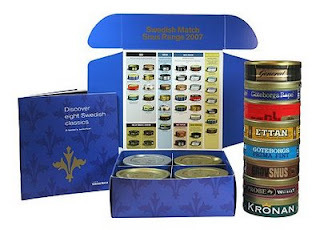 Ever heard of snus? This smokeless Swedish tobacco product combines a nicotine punch without the nasty spitting and mouth cancer risk of the chew. One little packette tucked into your favorite quitter's mouth quiets their grating nerves. And there's no smell, no chew, and far less risk (let's face it: there's no buzz anywhere without risk). Order a sample pack for the quitter in your life. It's shipped from Sweden, but it's still far cheaper than the aforementioned patch or obnoxious gum. Read more about it at www.northerner.com. It'll make quitting for 2009 easier for everyone. You always have that one friend who makes a New Year's resolution. It's always the same, too: lose the weight and get in shape. This, usually said either in a bar after slamming nine Pink Squirrels or at an Eggs Benedict brunch. Well, take them up on their little jump start plan with some irony. Send them some food with enough chile power to jump start their metabolism into hyper space. Start with habanero strewn Howlin' Hot Sauce, then proceed to Pig Boy Willy's Red Chile Carne Adovada Mix, jars of both Red and Green Chile sauce, and a little Chile Peanut Butter for those post-workout snacks. Yes, it all sounds counter-productive, but have you ever been to New Mexico? Those people eat this stuff all day long, are thin, and exercise plenty to counteract the chile burn. They're onto something, so you might as well exploit their methods for your friend's end. All these incendiary products are waiting for you at www.thechileshop.com. Order some and get them to feel the burn, literally.